▶ Development of standards and guidelines. ▶ Education of staff to enhance ethical decision making. ▶ Ethical decision making on issues from allocation of resources to the referral process and aspects of care'. 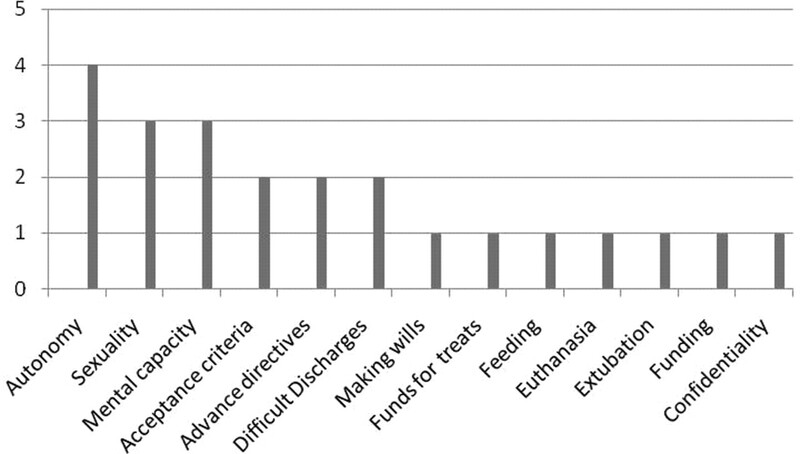 This study explores the value of a clinical ethics committee in a children's and young adults' hospice setting, and assess how far this committee has achieved its aims. Methods Data was collected retrospectively by analysing the minutes of the Committee's meetings and relating this to its terms of reference. Results Thirty six regular quorate minuted meetings have taken place since 2004. Additionally, two extra-ordinary meetings were called. There has been a wide variety of topics on the agenda, covering actual dilemmas for the Care Team (see figure 1), and scenarios (see figure 2). Twelve research projects were assessed (2/3 from external researchers, 83% qualitative research). Five guidelines and one policy statement were agreed (see table 1). Issues relating to education were addressed directly in eight (22%) meetings.